Angel Perez's passion for crabbing nearly cost him his life when he was infected with a flesh-eating bacteria in South Jersey last July. The Millville man survived, and is adapting to a much-changed life after losing portions of both arms and both legs. Angel Perez Barely Survived Flesh-Eating Bacteria. He's Adapting to His Changed Life. Angel Perez, of Millville, New Jersey, saw his life changed forever after contracting a bacterial infection in 2018. Eventually, he lost the lower portions of both arms and both legs. Still, he says he's a fighter, and with the help of his family, he's going to learn to live without his limbs. Angel Perez was infected July 2, 2018, by a bacteria called vibrio vulnificus during a crabbing trip to the Maurice River in South Jersey. The infection, which cost him parts of all his limbs, was likely caused by the bacteria entering his bloodstream through an open wound. Perez's severe reaction is very rare, an expert told NBC10. But the bacteria is deadly, as published reports from recent years have shown. Angel Perez didn't let Parkinson's Disease slow him down. The Millville, New Jersey, man spent much of his free time in the summer crabbing along the riverbanks and shorelines near his South Jersey home. Then his pastime nearly killed him. A flesh-eating bacterial infection took hold in July 2018 after one of his trips crabbing at a popular Maurice River location. He nearly died, but after a long hospital stay and numerous surgeries, Cruz, 61, survived. Yet he lost the lower portions of both his arms and both his legs. A Cumberland County man may lose his legs after being infected with flesh-eating bacteria during a crabbing trip. "You feel depressed," he said in the immediate aftermath of such a dramatic change. But he said, "I didn't pay no mind to that. Because God's got the last word." His hard work has inspired his family, which Perez in turn credits for pushing him to fight on. He has even begun walking on prosthetic legs. Perez's scary medical battle began when he noticed a skin rash after crabbing in the Cumberland County river near Matt's Landing in Commercial Township. Soon, his legs started to swell and lesions began appearing on his skin. The next day, July 3, he took two trips to local urgent care centers. "It got worse. He started to swell up. You started seeing color change, blistering," his daughter said. "He was hallucinating at one point." By July 4, he went to the hospital and was admitted to intensive care, diagnosed with a rare infection called vibrio necrotizing fasciitis. Angel Perez in 2018 following one of numerous surgeries. See larger photo. 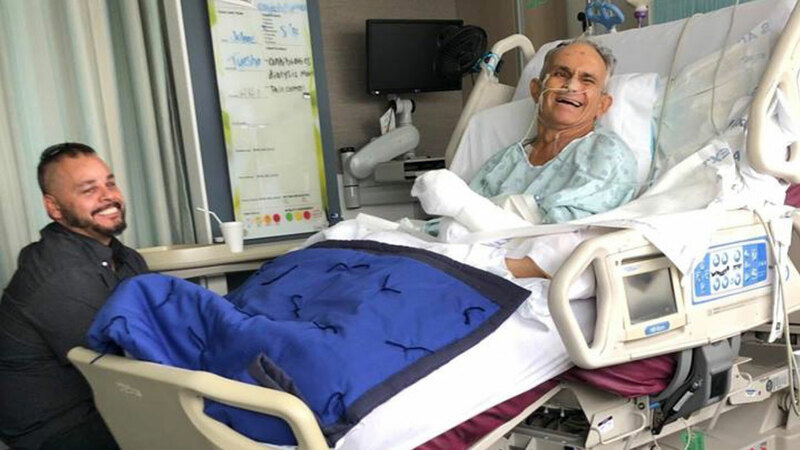 Perez's severe reaction to the infection from a bacteria called vibrio vulnificus is extremely rare, Cumberland County, New Jersey, health officer Megan Sheppard told NBC10 at the time. It was likely caused by the bacteria entering his bloodstream through an open wound. Vibrio vulnificus is common in New Jersey saltwater and brackish water, especially in the summer months, Sheppard said. Most of the 80,000 cases of infection in the United States each year are caused by eating raw or undercooked shellfish, she said. Only about 205 of those cases develop from infections caused by the bacteria entering open flesh wounds, as is suspected in Perez's case. "The immuno-compromised are typically more susceptible, " Sheppard said, adding that many cases involve vomiting and falling ill, but not the potential loss of limbs. Still, several cases, including fatal infections, have popped in recent years, according to published reports. The small sandy stretch off Matt's Landing Road where Perez is believed to have been crabbing in the river has not been shut off to the public, as it is not an approved beach area anyway, Sheppard said. Crabbing or fishing in the water increases the chances of a bacterial infection, compared to fishing from a boat or dock, she said.